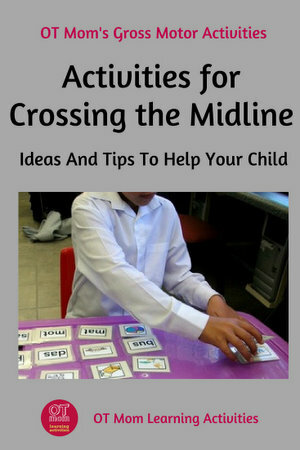 These fun activities for crossing the midline are easy to implement at home and come with lots of photos to show you just what to do! Simple games with balls and bean bags can be adapted to make great activities for crossing the midline. Start by having your child kneel or sit cross-legged on the floor as shown above. This will help to stabilize the hips and legs, then the hands and arms can move freely across the midline. Have the thrower stand slightly to the side, so the catcher must turn the upper body to catch and throw the ball. Do this on both sides, and gradually increase the angle at from which the ball is thrown, to increase the amount of midline crossing. Any object could be used, as long as the child passes and receives the object with both hands. Make sure that they are sitting either cross-legged, or on their knees. Two kids sit back to back and pass the ball around to each other. In this game, the child is seated, and throws across the midline to a target with the dominant hand. AVOID THIS! Here, the lower body has moved with the upper body, and there is no trunk rotation and thus no midline crossing! Make sure your child's hips and legs stay facing forwards while the upper body turns. Using “Lazy-8”’s has long been a popular way to help a child to cross the midline. Vertical surfaces work best - use a blackboard, whiteboard or even an outside wall! MAKE SURE your child is positioned in the center of the "lazy 8" and has one hand on the board/paper for stability. Let your child rub out the "Lazy 8" with a scrubbing brush or large sponge. Using both hands and moving the brush/sponge in all directions, will subtly help your child to cross the midline with both hands. A bit messy, but lots of fun… rubbing shaving cream on a wall with both hands, and then using the hands one on top of the other to draw a large circle or loop, will help your child to cross the midline with both hands. Bear Paw Creek's stretchy band can be used very effectively to work on midline crossing skills with a group of kids! Have your kids stand in a circle and hold on to the stretchy band. These 3 kids are holding 2 bands which have been joined together to make a longer one. Start clapping a beat or singing a song and have the kids move the stretchy band hand over hand around the circle in a rhythmical way. They should be crossing the midline as they reach from side to side. You can view the stretchy band and other fun gross motor products at Bear Paw Creek. 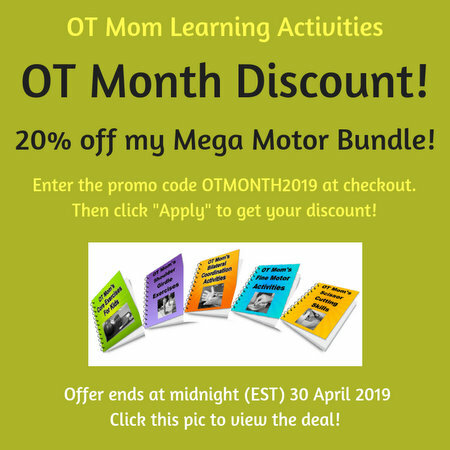 Use the coupon code otmom to get 10% off your purchase! You can also order Stretchy Bands through Amazon. Info, Tips and a Free Handout! 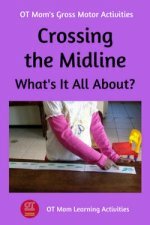 ﻿Read my article on Crossing the Midline to learn more about this important skill. If your young child has not yet established a dominant hand, then start with the activities that use both hands to cross the midline on both sides (eg the scrubbing brush, ball relay, ball pass). You may share these free PDF downloads to help others. But please do not link directly to the PDF from your own blog - rather link to this article. Thank you! 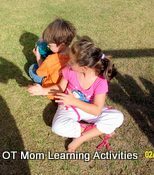 For more activities to do at home, why not check out my OT Mom E-books? Or sign up for my newsletter to keep in touch with new pages on my site!